Product prices and availability are accurate as of 2019-04-19 18:09:24 UTC and are subject to change. Any price and availability information displayed on http://www.amazon.com/ at the time of purchase will apply to the purchase of this product. The fastest way to improve your game is through practice and personal coaching. 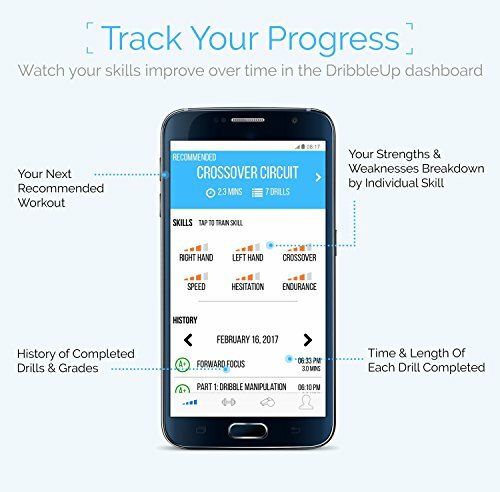 The DribbleUp smart basketball tracks your progress and gives you targeted instructions based on your weaknesses so you know where to concentrate your efforts. 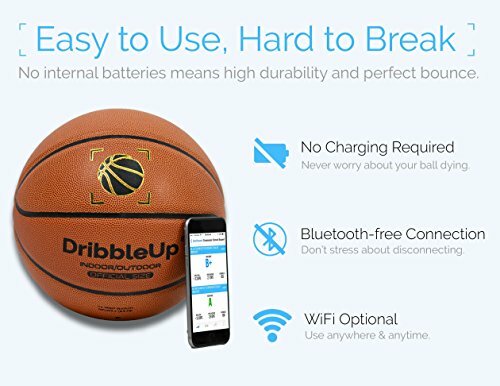 The high quality smart basketball has a microfiber finish and has the same size, weight, and feel as a top quality regulation basketball, with no need for batteries or charging. Whether you're just picking up a basketball for the first time in your life or you're an advanced player looking to sharpen your skills, the DribbleUp smart basketball will help you improve. It's guided training tracks and analyzes your moves, then shows you where you need to focus. It provides the exact drills needed to make those critical improvements. You'll be able to see exactly how much your skills have improved over time. You can even create shareable videos to see yourself in action just like the pros. Live audio feedback gives you the full personal virtual coaching experience. DribbleUp brings out the best in every player. For nearly the same price as a regular basketball alone, you get a complete personal coaching, tracking, analysis, and training tool. You get guided training with our exclusive iOS and Android app, a smartphone stand, and, of course, a top quality regulation basketball. 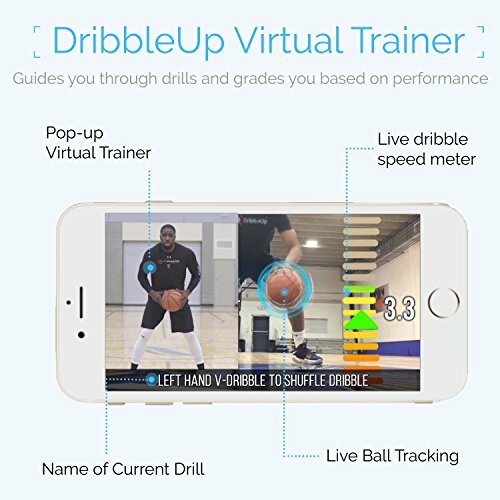 FASTER IMPROVEMENTS WITH GUIDED TRAINING: Your DribbleUp virtual coach guides you through workouts and provides expert analysis so you'll see improvement in your ball handling skills quickly. UNLIMITED TRAINING. 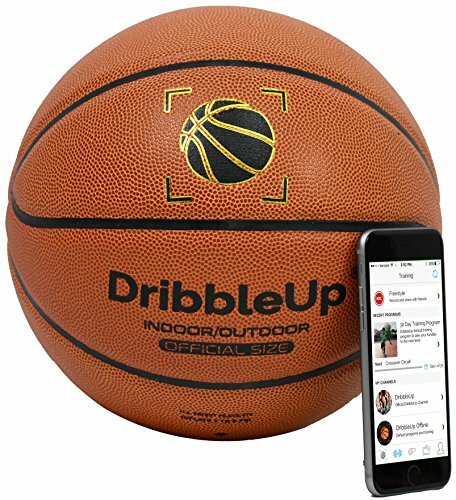 ANYTIME, ANYWHERE: The ball and app is all you'll need for access to unlimited training with the DribbleUp virtual coach. Practice for as long as you want in the driveway, the basement, the gym, or anywhere else with the best. With more and more drills being added to the app regularly, training truly is limitless. YOU CAN ONLY IMPROVE WHAT YOU MEASURE: Measure your crossover speed, dribble hesitation, endurance level and track your dribbling live with an interactive dribble speed meter. 30-DAY GUIDED TRAINING PROGRAM: The included app is your secret weapon for the basketball court. Handy smartphone stand comes included. 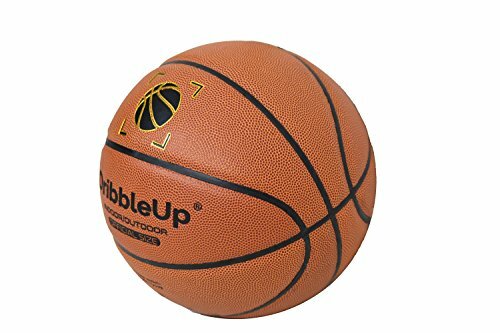 This official size and weight microfiber basketball is ideal for indoor and outdoor courts making it the perfect basketball gift PUSH YOURSELF FURTHER WITH LIVE AUDIO FEEDBACK: Maximize your performance with the unique, live audio feedback from your very own virtual coach. Take this personal trainer with you wherever you go and train on your own schedule without needing a basketball coach present.